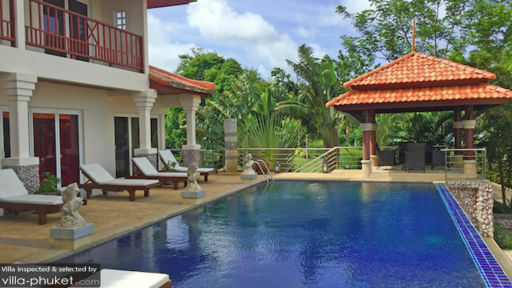 Nestled away in the hillside area of Klong Khong, Villa Serena looks out to the sea and a beautiful tropical landscape. 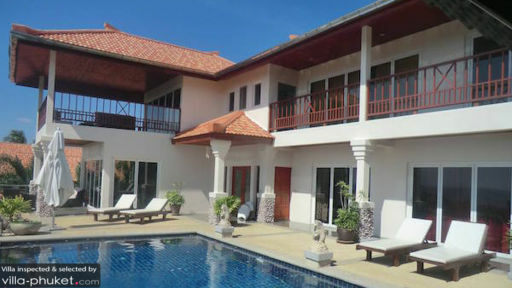 Featuring four bedrooms in total, the villa is ideally set up for groups of eight, but can be rented as a three or two bedroom villa for smaller groups. With a full range of modern amenities and weekly housekeeping, Villa Serena is primed to offer a comfortable and cosy stay. 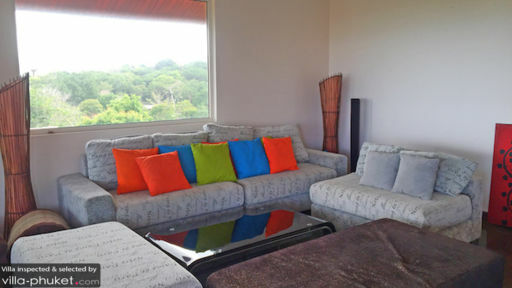 Containing four bedrooms, Villa Serena is best suited for groups of eight. The master bedroom, set at a prime location on the upper floor enjoys some of the best sea views in the home. A spacious en suite bathroom, complete with bathtub and shower extends out of the room. It’s a great spot for unwinding with a soak while taking in the stunning coastal landscape. All three guest bedrooms are equipped with double beds, air conditioners, generous wardrobe spaces and private en suites. Spread out over the ground floor, each of the rooms offers direct pool access. Two capacious outdoor spaces, in addition to a private terrace extending out of the master bedroom invite vacationers to spend their days soak up the tropical vibes outdoors. When you’re not dipping into the glistening pool, you’ll be drying off upon the sunbeds, relaxing at the outdoor lounge or enjoying cocktails under the poolside sala - all while taking in views out to the sea and lush greenery. The living spaces at Villa Serena are spread out over two storeys. Meals are enjoyed at the upper floor dining area - a generously proportioned space with commanding views of the sea. Push back the glass bi-folding doors for indoor-outdoor dining, or keep the area enclosed for air conditioned comfort. There’s also the option of dining al fresco by the poolside terrace. Relaxation comes easy in the expansive living area. It’s kitted out with an -shaped sofa, flat screen TV with DVD player and enjoys incredible sea views. A fully equipped kitchen makes meal preparation a breeze - you’ll find all the essentials, like a oven, stove, fridge, microwave, blender, coffee maker, dishwasher and cookware. Villa Serena enjoys a weekly housekeeping service. Airport transfers, daily breakfast, check out cleaning and laundry are available at additional cost. Local amenities and attractions are within easy reach of Villa Serena. Hop into a car for a seven-minute drive out to Long Beach. It’s the most popular beach on the island, with a wide frontage, soft, golden sand and a relaxed ambience. Stay on for a gorgeous sunset show accompanied by sundowners; some of the best venues are Ozone Bar, Pangea Beach Bar, The Irish Embassy and Galaxy Restaurant and Bar. Round out your evening with a fine dining meal at Tides Restaurant. There’s The Indian Tandoor if you’re seeking a change from Thai fare. When you’re not relaxing by the beach, try out activities like stand up paddleboarding yoga, deep sea fishing, scuba diving, sailing and catamaran tours or sea and mangrove kayaking. Take a stroll around Lanta Old Town (about 30 minutes’ drive) to take in the sight of its traditional Thai shophouses and explore its shops and restaurants. Location, view and house is perfect for the dream holiday for the family or long stay. With its many bedrooms and two pools it's also great for representation and business events with the management group. Koh Lanta offers a wide array of beaches, activities and restaurants and everyone can compose their own dream holiday. I had a great week here and can strongly recommend the house.